Meet Yahya Assiri, a Saudi military officer-turned-activist who runs an underground human rights group against one of the most oppressive states in the world. Born in a region of Saudi Arabia that fiercely resisted the al-Saud family and its fundamentalist Wahhabi allies, he grew up in a polarized family environment: his grandmother despised the government and its ultraconservative brand of Islam, while his father, like most in his generation, was more favorable to the royal family because of the wealth and security it provided. Exposure to these opposing views instilled in Assiri a penchant for asking questions, even while he was climbing the ranks of the military. After failing to fulfill his lifelong dream to be a pilot, he joined the administrative side of the Royal Saudi Air Force, where he often worked on international arms deals (Saudi Arabia is one of the largest importers of military equipment). He regularly heard colleagues complain about their meager salaries and struggles with debt and poverty, which sat uncomfortably with the sheer wealth of the royal family and the claims that it brought prosperity to Arabia. At 24-years-old he began to ask questions internally about these issues, describing himself as a sensitive person who could not ignore the suffering around him, even as he progressed swiftly through the air force and earned good money. Initially resisting the desire to speak out — knowing full well the risks — he began exploring the internet, finding a series of websites and forums in Arabic where people were debating politics. Thus began a double life in which Assiri worked for the government by day but spoke against it online through a pseudonym by night. Eventually, his online activities gave way to participating in actual public forums, namely at the home of a prominent Saudi human rights activist, Saud al-Hashimi, who Assiri credited as a pivotal figure in his life. In 2011, Hashimi was arrested and jailed in for 30 years on the false charges of “supporting terrorism”, which galvanized Assiri further. Why didn’t regular Saudis have a voice? Why was the regime so afraid? And why was it so wealthy while average Saudis around him struggled? As more activists got arrested around him, and the government began asking questions about his online activities, Assiri, who by now had a wife and two kids, made the difficult choice of leaving behind his otherwise prosperous life to seek asylum in the U.K. There he founded his own human rights group in August 2014 to keep the fight going. Knowing that authorities usually dismiss international human rights groups as foreign agents trying to impose Western values, he cleverly chose the name Al Qst, which is a Quranic term meaning justice. Assiri wishes to keep the group exclusively Saudi-run so that it cannot be easily dismissed by the authorities nor skeptics. The ultimate goal is to grow Al Qst into a strong civil society organization, since civil society is very much lacking in the country’s stifling sociopolitical environment. Assiri is a reminder that even in the most blighted places, there is some flicker of hope, and not everyone who lives under an odious government is spoken for by that government (something a lot of Americans who otherwise hate one administration or another ironically forget). Read more about him in this 2015 article (there was not much else out there that I could find). 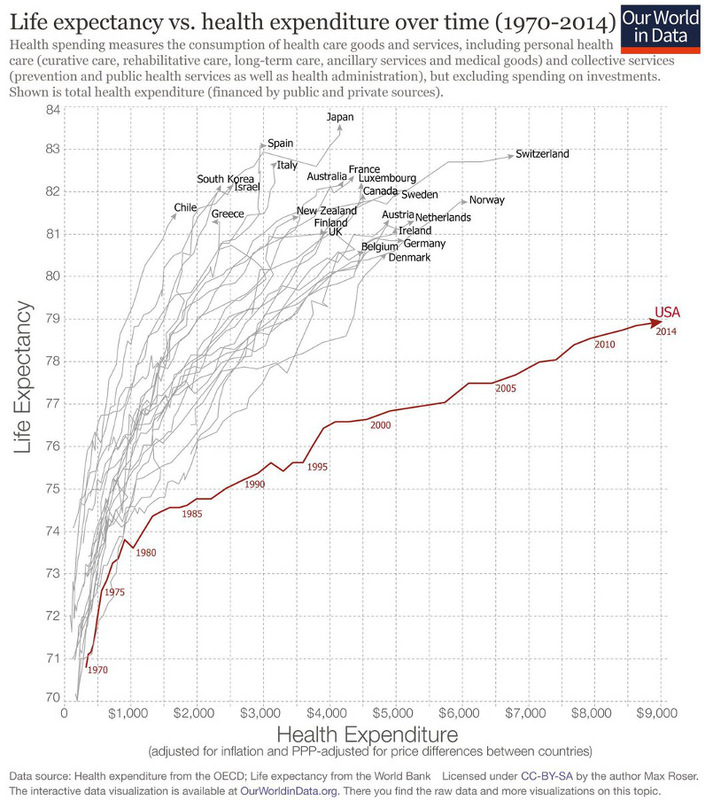 American exceptionalism certainly has its merits: when it comes to healthcare, the U.S. is most definitely exceptional, albeit not in a good way. Virtually no country comes close to spending so much on healthcare with so little payoff: a little over twenty years ago, the U.S. spent about 13 percent of GDP on healthcare compared to a developed-world average of about 9.5 percent; by 2016, our spending hit 17.5 percent of GDP–or $3 trillion. As you can see, Americans are spending more money – but they are not receiving results using the most basic metric of life expectancy. The divergence starts just before 1980, and it widens all the way to 2014. It’s worth noting that the 2015 statistics are not plotted on this chart. However, given that healthcare spend was 17.5% of GDP in 2015, the divergence is likely to continue to widen. U.S. spending is now closing in on $10,000 per person. Perhaps the most concerning revelation from this data? Not only is U.S. healthcare spending wildly inefficient, but it’s also relatively ineffective. It would be one thing to spend more money and get the same results, but according to the above data that is not true. In fact, Americans on average will have shorter lives people in other high income countries. Life expectancy in the U.S. has nearly flatlined, and it hasn’t yet crossed the 80 year threshold. Meanwhile, Chileans, Greeks, and Israelis are all outliving their American counterparts for a fraction of the associated costs. I am not sure how much more data we need to prove that our healthcare system is broken. So many other countries with fewer resources have managed to extend average life expectancy without breaking the bank. Yet for all our innovation and wealth, we are breaking the bank by a wide a margin and still having little to show for it. That, in essence, is the finding of one of the largest studies of its kind on what is officially known as the Supplemental Nutritional Assistance Program (SNAP). Since being nationally mandated in 1975, SNAP has remained the largest national anti-hunger program: last year along, more than 40 million poor working families, people with disabilities and seniors received assistance averaging to about $125 monthly; 70 percent live in households with children. Whatever the moral case for supporting SNAP, there is certainly an economic one, as one of the largest studies of its kind recently proved. The economists focus on people born between 1956 and 1981, who were young children when the program was expanding, and who grew up in families with a parent with less than a high school education. They find that access to the program as a young child significantly improved economic outcomes and health status as an adult. In particular, food stamp access as a child was associated with much lower risk of metabolic syndrome as an adult and, especially for women, higher levels of educational attainment and income along with lower participation on means-tested benefit programs. For example, food stamp access during childhood is linked to a 5 percentage point reduction in heart disease and an 18 percentage point increase in high school completion rates, compared to those who lacked access. This evidence contradicts some critiques of food stamps, which misleadingly argue that it’s an inefficient and ineffective program. The authors also highlight that access seems to matter most in utero and up until age 5. Gaining access to food stamps after age 5, by contrast, didn’t improve health outcomes as an adult, perhaps because the person had already been put on a particular health trajectory by that age. The study also demonstrates the importance of taking a long-term view of these sorts of programs, especially when children are involved. Various other studies suggest that investing in the formative early years of one’s life pays huge dividends later; that is obviously lost on those who focus only during the year the benefit is received. Starting next summer, Luxembourg, a small country of 600,000 located between France and German, will remove all fares for buses, trams, and trains, making it the first country with free public transportation. Let’s see if other, bigger countries take note. This past Friday, Buenos Aires, Argentina hosted the 13th summit of the “Group of Twenty” (G20), which consists of 19 of the world’s largest economies plus the European Union. Collectively the G20 accounts for around 85% of global GDP, 75-80% of world trade, two-thirds of the world’s population, and about half the world’s land area. Hence it is one of the most influential and important gatherings in the world, even though it is not a formal institution like NATO or the United Nations. Pew recently conducted polls around the world to gauge global public opinion about some of the pressing issues on the agenda at this year’s summit. For example, most nations are skeptical of the current economic situation, except for the Netherlands, Sweden, Germany, the Philippines and a few others. A fair number of people–notably Brazilians, Greeks, and Tunisians–had more hope for their economic future. The U.S. and Canada were interestingly pretty happy about the current state of their economies, but deeply pessimistic about their children’s future. Similarly, most people around the world approve of trading with other countries and yet are nonetheless pessimistic about the benefits for jobs and wages. And with the notable exceptions of Poland, Japan, and Hungary, the majority of people did not think automation would make their economies efficient; moreover, no country had a majority of people agree that automation would create newer and better jobs. Finally, the leaders of the U.S., Russia, and China — currently the top world powers — are deeply unpopular, whereas Germany’s Merkel and France’s Macron had the most global confidence (and only Merkel got a majority of confidence, albeit at 52%). Whatever your view on guns, the causes of gun violence, and the best solutions, we should all agree that the data are overwhelmingly clear: for one reason or another (likely multiple reasons) the U.S. has an unusually high rate of violent gun deaths (which doesn’t include accidents and suicide, as these tend to inflate the figures). When you consider countries with the top indicators of socioeconomic success — income per person and average education level, for instance — the United States is bested by just 18 nations, including Denmark, the Netherlands, Canada and Japan. The numbers come from a massive database maintained by the University’s Institute for Health Metrics and Evaluation, which tracks lives lost in every country, in every year, by every possible cause of death. The 2017 figures paint a fairly rosy picture for much of the world, with deaths due to gun violence rare even in many countries that are extremely poor — such as Bangladesh, which saw 0.07 deaths per 100,000 people. As a law student, I aspire to balance a fulfilling career with legal advocacy, taking on causes pro bono for those who lack the means to seek justice. That is why I seek inspiration from the thousands of lawyers and jurists around the world who dedicate themselves to giving a legal voice to the voiceless — often at great risk and sacrifice. After saving condemned Christian Asia Bibi from the gallows in Pakistan, her lawyer says he is facing the wrath of Islamist extremists – and wonders who will save him. But despite the threats against him, Saif-ul-Mulook says he regrets nothing, and will continue his legal fight against intolerance. Mulook’s latest victory saw the freeing of Asia Bibi – a Christian woman convicted of blasphemy, who spent nearly a decade on death row – after the Supreme Court overturned her conviction on Wednesday. The defence of Bibi was just the latest in a long line of controversial cases taken up by the barrister. In 2011, Mulook was the lead prosecutor against Mumtaz Qadri over the assassination of Punjab governor Salman Taseer – a prominent critic of the country’s blasphemy laws and supporter of Bibi. Qadri – one of Taseer’s bodyguards – gunned down his boss in broad daylight, citing the governor’s calls for reform of the blasphemy laws as his motive. Mulook said he took on the case as others cowered, fearing reprisals from extremists. His prosecution resulted in the conviction and subsequent execution of Qadri, who was feted by Islamists and later honoured with a shrine on the outskirts of Islamabad. If this man can brave violent extremism to save the lives of those condemned by both public opinion and an unjust legal system, I am pretty sure I can stay true to my goal. United States v. Wong Kim Ark was an 1898 U.S. Supreme Court case in which the Court ruled 6–2 that a child born in the U.S. to Chinese nationals with permanent residence—but not citizenship—automatically becomes a U.S. citizen. The ruling established a key—and as of now legally unchallenged—precedent that the Citizenship Clause of the Fourteenth Amendment (ratified in 1868) should be interpreted broadly. Plaintiff Wong Kim Ark, who was born in San Francisco in 1873, to Chinese parents who were legally domiciled and resident there at the time. Following a trip abroad, Wong returned to the U.S.—which had done without incident before—only to be denied entry based on the 1882 Chinese Exclusion Act, which prohibited immigration from China. Border agents argued that Wong was actually a Chinese subject rather than a citizen because his parents were Chinese, and thus the Act applied to him. Wong challenged the government’s refusal to recognize his citizenship, and both the district court in California and the Ninth Circuit Court agreed he had citizenship. The government appealed all the way up to the Supreme Court, which had never decided the question of the citizenship status of U.S.-born children of alien parents. The case highlighted disagreements over the precise meaning of Citizenship Clause—namely, the provision that a person born in the U.S. who is “subject to the jurisdiction thereof” acquires automatic citizenship. The Supreme Court’s majority concluded that the clause needed to be interpreted in light of English common law—from which the U.S. legal system derives—which for centuries had recognized virtually all native-born children as automatic citizens, except those born to foreign rulers or diplomats, born on foreign public ships, or born to enemy forces occupying the territory in wartime. Thus, they concluded that the phrase “subject to the jurisdiction thereof” referred to being required to abide by U.S. law, thereby granting U.S. citizenship to at least some children born of foreigners because they were born on American soil—a concept known as jus soli, or “right of soil”. By contrast, the court’s dissenters argued that being subject to the jurisdiction of the U.S. meant not being subject to any foreign power—i.e. not being a citizen by another country, such as through jus sanguinis (“right of blood”), citizenship is granted only to anyone born to a citizen (this is the most common approach worldwide). This interpretation would exclude most children of foreigners, such as those whose parents were staying for a limited time, or who otherwise have no intention of becoming U.S. citizens. This foreshadowed the current debate about whether birthright citizenship should apply to children born to illegal immigrants. However, the dissenters also cited racial and cultural reasons why Chinese, in particular, could not be full-fledged citizens, namely that Chinese law made renouncing one’s allegiance to the Emperor a capital crime. Of course, this assumed such allegiance mattered to one’s eligibility for U.S. citizenship: based on the two dissenters’ interpretation of jurisdiction, it does, since it means they are thus subject to a foreign power; but the other six justices rejected this argument, since they interpreted jurisdiction differently. The dissenting opinion also rejected this claim, agreeing with the Court that “the Equal Protection Clause of the Fourteenth Amendment applies to immigrants who, after their illegal entry into this country, are indeed physically ‘within the jurisdiction’ of a state.” The dissent simply concluded that the distinction the statute drew should survive an equal protection attack. Nonetheless, legal scholars remain increasingly divided about Wong Kim Ark’s application to children born to illegal immigrants. One argument is that the jurisdiction of the U.S. requires a status of “full and complete jurisdiction” that naturally does not apply to foreign nationals who are in the country illegally. A counter-view is that because Wong’s parents were themselves not eligible for citizenship and other rights, their situation is very much like those of illegal immigrants. Scholars differ on the original intent of the Fourteenth Amendment, with some claiming the drafter never had in mind to permit unconditional jus soli citizenship, while others have found debates and conversations among the Senators involved suggesting that they did. The former British colony saw its number of ultra-wealthy increase 31 percent last year, to about 10,000, research firm Wealth-X found, higher than the nearly 9,000-strong population of the U.S.’s largest city. Tokyo came third, while Paris beat out London to take the European crown as Brexit weighed down the U.K. capital. The number of ultra-rich worldwide rose 13 percent last year, according to Wealth-X, totaling about 256,000 people with combined assets of $31.5 trillion. Asia saw the fastest growth, driven by mainland China and Hong Kong, the study’s authors wrote. Reflecting the region’s rise, its share of the global population of people with at least $30 million rose to just over one-fourth, up from around 18 percent a decade ago. Women accounted for about 35,000 of the ultra-rich last year, a record-high share of nearly 14 percent, the study found. Similarly, no city in mainland China made the top ten, despite the country being third in the list of nations. That is because China’s wealthy are widely dispersed throughout the numerous economic and metropolitan hubs across the country — in fact, all but four of the 30 fastest-growing cities for the ultra-rich are Chinese. Moreover, Bloomberg notes that the sheer scale of wealth is being pushed ever upward: though billionaires are of course still rare, they are less so than they used to be; the same goes for millionaires of all levels. One should ask how it is that the global economy can produce such unfathomable concentrations of wealth into a sliver of individuals and communities, when literally half the world remains mired in poverty (and most of the remaining half teetering). Around the same time that Hong Kong climbed to the top spot as home to the ultra-wealthy denizens, its poverty rate has increased to one out of five residents.